A San Francisco family is speaking out about anonymous letters they say they received this summer — including one that used the derogatory term “chink” — telling them to remove a Black Lives Matter sign. 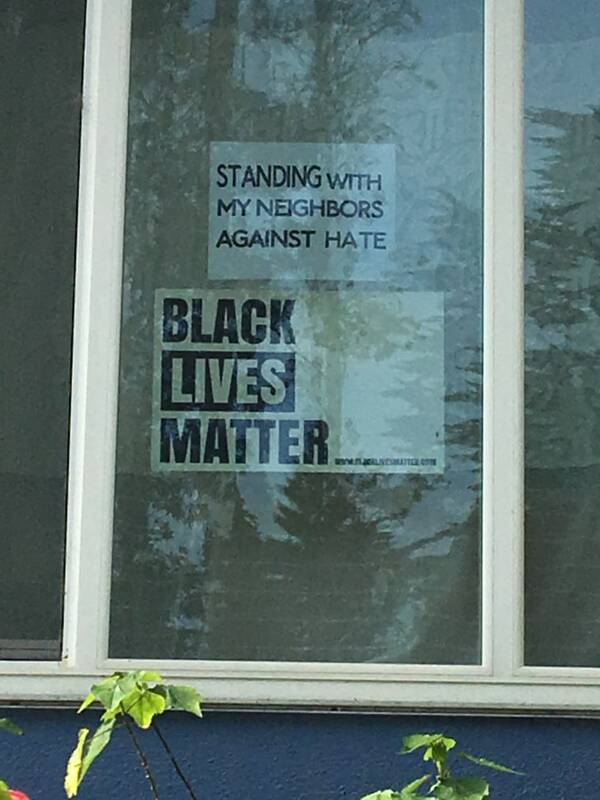 Debbie Lee, 64, told NBC News the first unsigned typed note allegedly came in the mail in mid-July, apparently in response to a Black Lives Matter poster their daughter brought home and that the family placed in their living room window in early 2015. Then came a second anonymous letter, postmarked Aug. 14, according to Lee. There was no return address on the envelope, she said. Lee, who is Chinese American, said her husband, Bill Tamayo, who is Filipino American, decided they should report it to the police, which she said they did on Aug. 17. “This was more disconcerting because we felt like this was someone who passes by our house and knows that we’re Asian,” Lee said. San Francisco Police Department Officer Robert Ruca told NBC News that the case was an open investigation and whether or not it was a hate crime is being investigated. "We're not ruling anything out," he said. The number of reported hate crimes in California rose 11.2 percent from 2015 to 2016, according to a report by the California Department of Justice. While the rate of change of reported anti-Asian crimes was not calculated due to the low relative number of reported crimes, the number of reported anti-Black or African-American hate crimes jumped 8.7 percent, according to the report. Lee said they hung the Black Lives Matter sign in their window more than two years ago because of their concerns around discrimination and disparities in the African-American community. She said they took down the sign for 2½ weeks in August while friends stayed at their home, but put it back up right after. Lee and her family sent a note on Aug. 29 to neighbors informing them of what had happened, and they also told San Francisco Supervisor Norman Yee, according to Lee. Yee presented Lee and her family with a commendation from the San Francisco Board of Supervisors during a neighborhood meeting with police Monday that they were previously planning to attend, Lee said. She said she hadn’t contacted the media, but said press was present that night. Lee and her 26-year-old daughter, Celi Tamayo-Lee, spoke to them about their ordeal, according to Lee. “We really wanted to engage the community, to talk to them about what had happened to us...hoping that they will stand with us,” Lee said. Lee brought them to Monday’s meeting, she said. Lee, who has lived with her family in their Forest Knolls neighborhood home for nearly 25 years, said their daily routine has changed since receiving the letters. “But, you know, yeah, it makes me pause,” Lee added. After consulting with friends, Lee said they decided they should speak out, particularly as an Asian-American family. “I think sometimes Asian Americans forget, and they believe that there isn’t as much discrimination as there is, and that we have to stand with other people of color,” she said. Lee said she doesn’t know who’s behind the letters, but had this message for the author.